We’d love your help. 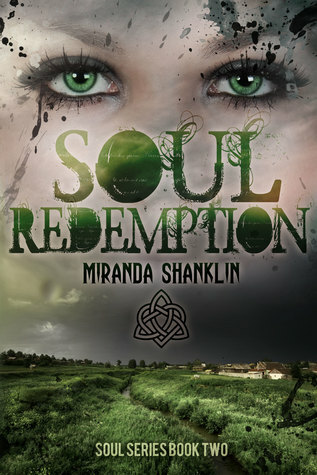 Let us know what’s wrong with this preview of Soul Redemption by Miranda Shanklin. Just when Annisa and her friends were starting to think maybe the Counsel would leave them alone, two new students arrive at school. In any other town, new students wouldn’t be a sign that something big was about to happen to Annisa, Chase, Landon, and Penelope; but this wasn’t a normal town and they weren’t normal teenagers. They had come into their powers and defeated th Just when Annisa and her friends were starting to think maybe the Counsel would leave them alone, two new students arrive at school. In any other town, new students wouldn’t be a sign that something big was about to happen to Annisa, Chase, Landon, and Penelope; but this wasn’t a normal town and they weren’t normal teenagers. They had come into their powers and defeated the most feared assassin in their world, so the appearance of new witches in their small town could only mean one thing…..the Counsel was ready to make another attempt to destroy them. After watching the new students alienate them from everyone they know, including their parents, Annisa and her friends break through the spell and things start to calm down for them. It’s not until an old enemy returns with news that will shock them that they realize everything is not as it seems. Now they have to decide whether or not to trust an old enemy claiming to help them, or try and fight against the Counsel’s most trusted Advisors on their own. To ask other readers questions about Soul Redemption, please sign up. This books picks up a very short time after the first. The gang Annisa, Chase, Penelope, and Landon have barely even had a chance to settle down before they are hit with a new danger. The Advisors, a group of witches who feel they are more powerful and more deserving than others. The gang is their main threat and they set off to try to eliminate that threat before it gets too bad. We meet two new teenagers, Amy and Brian a couple we spend a small part of the book trying to figure out just who these two are and what they are doing. We run into old foes turned friend with Rayne, who I must say is probably my favourite character. We also introduced to more new friends and enemies throughout the story as we read about our heroes on their quest to keep their town and their family safe against the evil forces at work. Mix in a little bit of drama and voila. I've got to say I liked this one more than the first. It was great seeing the story grow from what I read with this authors first novel. There were a few minor details I found bothered me a little bit, but I can't really explain them without giving away some important plot. It took me a little bit to get into this but once I did I enjoyed the story and I am looking forward to reading the next one :). Annisa and her gang of friends/witches is back in this thrilling tale of love and deceit. When 2 new students (Brian and Amy) arrive at school, the gang is taken by surprise with how distant everyone is starting to become around them. Anger flares between classmates and parents, even teachers are surprised by it. Not only are they having to deal with new students, but also Advisers from the Council! And to top that off, the Council is still coming for them! Annisa, Chase, Penelope, and Landon ar Annisa and her gang of friends/witches is back in this thrilling tale of love and deceit. When 2 new students (Brian and Amy) arrive at school, the gang is taken by surprise with how distant everyone is starting to become around them. Anger flares between classmates and parents, even teachers are surprised by it. Not only are they having to deal with new students, but also Advisers from the Council! And to top that off, the Council is still coming for them! Annisa, Chase, Penelope, and Landon are still trying to prove to the community of witches that they are good; not power hungry teenagers that want to rule over them. Will their summer vacation allow them to relax? What is Rayne doing there? Are Amy and Brian good witches, or are they corrupted by their parents/advisers? Will the Council realize that they are just normal teenagers who happen to just have super awesome powers? Another hit! This book could be read as a standalone (which I love when authors do it that way) but is MUCH better if you've read the 1st in the series. The kids are maturing in both their magic and their interactions with the endless conflict that plagues them. This novel has more action and a little less emotional drama due to the four being more confidant in their relationships and abilities; but don't worry-there's still enough to keep ya hooked! Great book-cant wait to finish the rest!! I received this book free from the author as part of a giveaway. I enjoyed this book just as much as the first in the series. I will definitely be reading the other books in the series. Lots of twists here with the witches coming into their powers. Great story!